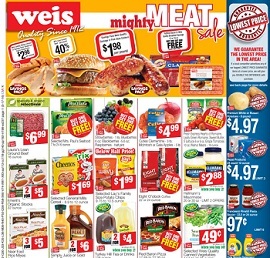 Browse Weis Markets Weekly Ad Circular, valid April 11 – April 24, 2019. This Week Weis best deals, printable coupons, savings and sale on: Tru Moo 1% Chocolate Milk – 1 gallon; General Mills Cereal; Gain Laundry Detergent; Francesco Rinaldi Pasta Sauce; Dietz & Watson American Cheese; French’s French Fried Onions; Turkey Hill Ice Cream; Golden Blossom Honey; Pompeian Olive Oil; Alaskan Cod Fillet Wild Caught; Choice Black Angus Top Round Steaks; Choice Porterhouse or T-Bone Steaks; Boneless Pork Loin Roasts; Perdue Roasting Chicken; Sugardale or Smithfield Spiral Hams; Pedigree Dry Dog Food; Fresh Asparagus or Brussel Sprouts; McIntosh or Gala Apples; Leafy Green Romaine; Gold Pineapples; Jumbo Navel Oranges, Cara Caras, Minneolas, Red Grapefruit or Pummelo; Red and Green Bell Peppers; Roma Tomatoes or Jumbo Sweet Onions; and much more. Find all deals, offers, and prices in the latest Weis Weekly Sale Ad Circular for your local store.